The Jets have had some glory days, but largely have been rebuilding since winning Super Bowl III- or at least that’s the joke some fans sarcastically say. They had a nice run in the late 80s with things coming together offensively with guys like Freeman McNeil, Al Toon, and Mickey Shuler leading the way. 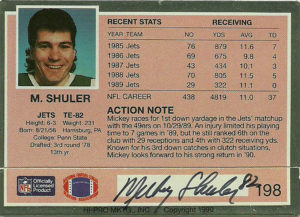 Mickey Shuler redefined the tight end position for the New York Jets. Originally drafted in the 3rd round of the 1978 draft out of Penn State, he set franchise records for the position with 76 receptions in 1985. A wily receiver, and solid blocker, Shuler had a nice, rare combination of speed, hands, and size that allowed him to earn 2 Pro Bowl berths and finish as the Jets second all-time leading catcher with 438 receptions in 102 starts. Rib and knee injuries ended Shuler’s 1989 campaign early, which contributed to his release after the season. At the time of his departure, he had a streak of 86 straight games with a reception. 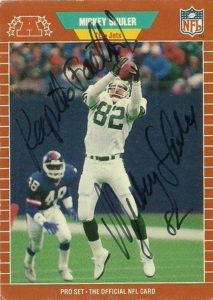 Mickey signed as a free agent with the Eagles, playing two seasons with Philadelphia retiring after the 1991 season. I had been looking for Shuler for sometime. I have vague recollections of him appearing on a daytime talk show during the 80s to educate women about football, but even at a young age, it was obvious to me that the women had eyes for Mickey and his slick Magnum PI-esque mustache. Luckily before the end of his career he had some great cards come out from different manufacturers than Topps. Among my favorite I really enjoyed these two entries from ProSet and Action Packed. 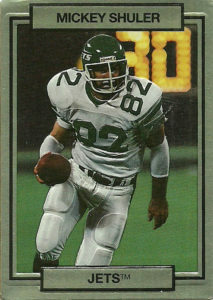 He also had some ignominious cards in 1990 that showcased him in his Eagles gear, but they all beat the profile/ on the sidelines shots that so punctuated Topps portfolio during that era. Mickey lives back in Maryland, where he is very active in his community. His son, Mickey Jr, eventually followed in his footsteps to Penn State at TE and into the NFL. He signed these two cards for me and told me to “Keep the Faith!”, in regards to my hope that the Jets will return to eventual glory.